What do you get when you mix Christmas and Hanukkah Holiday traditions together? You get to celebrate two Holidays and call it Chrismukkah. Until I started doing a little research on this Holiday Tree Topper coming to the Shark Tank, I honestly never heard the word Chrismukkah let alone knowing it's a Holiday Tradition practiced by thousands of Multi-Faith Families. The owners of the patented Chrismukkah Tree Toppers is Morri and Marina Chowalki, who have been selling popular Holiday items since 2009. When Morri and Marina first married and started having kids, they had a small problem concerning their religious faiths during the Holiday Seasons. Morri has raised a Jew and celebrated Hanukkah while Marina grew up and celebrated Christmas. As with all marriages that have any chance surviving long term, they decided to compromise and celebrate both Holiday traditions together. Probably the most recognized item most people have when celebrating Christmas is a Christmas Tree. With the Star of David as a symbol always present during Hanukkah, Morri decided to patent and invent a Tree Topper representing Hanukkah that sits on top the Christmas Tree and shows their Chrismukkah Spirit for both religions. 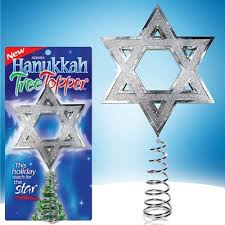 The Hanukkah Tree Topper became a Huge Success very quickly and soon was one of the Best Selling Tree Toppers of all time. The Tree Toppers come in two designs including the Original and now the Lighted Deluxe Hanukkah Model. The Chowalki's chose the Business name "One Life Products, Inc." believing Interfaith Families are still part of the same "One Life" no matter what religious faith you practice. The first question to ask is how many Families are celebrating Chrismukkah? According to My Tree Toppers Website, a very high percentage of Jew's marry outside the Jewish Religion giving this market lots of future growth. How many Hanukkah Tree Toppers have already been sold, and how much money One Life Products has already made in the past four years remains to be seen. With little documentation of their success, it looks like we'll have to wait until this Friday night on the Shark Tank Show to find out exactly how profitable this Business has become. Stay tuned and see if any of the Sharks are interested in the Chrismukkah Tree Toppers as an excellent investment opportunity. I want one of the open-frame design that is a little bit smaller (maybe 4" instead of 6") and has some blue on it. One thing that wasn't presented was that many Christians celebrate Jewish holidays - Jesus was Jewish, out heritge is Jewish, and we love the Jewish people! The Star of Davis is hugely special to us too. I'm buying the light-up version as I have never found a tree-topper that is as meaningful as this is! Thanks to Morri and his family, and to Damon seeing the value! Well done everyone.